During the winter season, Montreal can be cold and dark, but the annual Luminothérapie event lights up the night from December through January. The public art exhibition taps local artists, musicians, designers, makers, and more to make outdoor installations that are a feast for the eyes and the ears. One of the coolest exhibits this year is LOOP, an interactive and imaginative illuminated cylinder that, when activated, plays an animated fairy tale. With 13 different cylinders, there's plenty to keep visitors enchanted and transported into a creative adventure. Loop’s creators are multifaceted makers, with expertise combining several musical and artistic genres and a love of tech and gadgetry. They worked with a team of 50 to carry out their creative vision and make these large musical cylinders, which are known as zoetropes. Zoetropes create the illusion of movement by showing consecutive drawings or photographs that illustrate movement (a common one is a horse galloping). One of Loop’s creators was inspired by a trip to the Berlin Technology Museum where he saw a zoetrope and decided to combine that device with the mechanisms of a push car and a music box. RELATED | A Musical Swing Set that Illuminates & Plays Harmonies as People Swing! The resulting installations look like giant, people-sized hamster wheels and are fun for the whole family to experience. Once people climb in and begin rowing, the cylinder moves, displaying a 20 second animated loop set to music. The creators of Loop say that they like that their installation can be experienced in a variety of ways by both participants and bystanders, although we can’t imagine how anyone could resist climbing in and giving these zoetropes a go. You can check out these short videos (in French) to see a bit more about the Loop process… or head up to Montreal before January 29th to experience these playful and whimsical art, music, and technology mashups in real life. Loop's creators are multifaceted makers, with expertise combining several musical and artistic genres and a love of tech and gadgetry. They worked with a team of 50 to carry out their creative vision and make these large musical cylinders, which are known as zoetropes. Zoetropes create the illusion of movement by showing consecutive drawings or photographs that illustrate movement (a common one is a horse galloping). One of Loop's creators was inspired by a trip to the Berlin Technology Museum where he saw a zoetrope and decided to combine that device with the mechanisms of a push car and a music box. 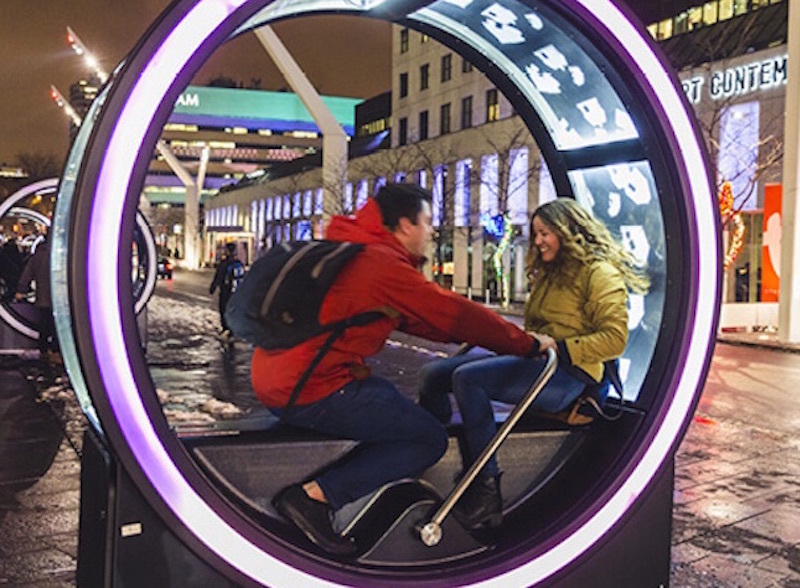 The resulting installations look like giant, people-sized hamster wheels and are fun for the whole family to experience. Once people climb in and begin rowing, the cylinder moves, displaying a 20 second animated loop set to music. The creators of Loop say that they like that their installation can be experienced in a variety of ways by both participants and bystanders, although we can't imagine how anyone could resist climbing in and giving these zoetropes a go. 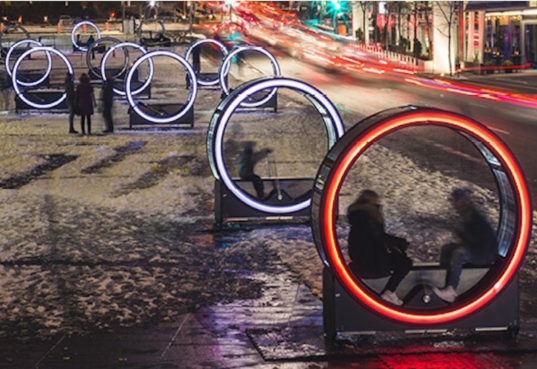 You can check out these short videos (in French) to see a bit more about the Loop process...or head up to Montreal before January 29th to experience these playful and whimsical art, music, and technology mashups in real life.